There’s nothing better than waking up to warm cinnamon rolls on the weekend. 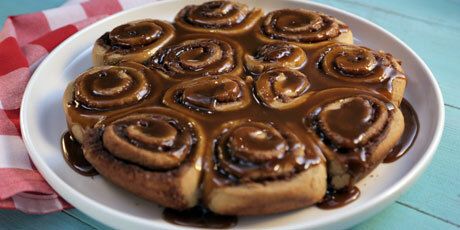 Make these classic cinnamon rolls with a Canadian twist – maple syrup! These rolls get topped with a maple glaze while warm – infusing the rolls with maple goodness from top to bottom. 1. In the bowl of a stand mixer combine warm milk, yeast and 1 tsp brown sugar. Let stand for 10 minutes until the mixture is frothy. 2. In a separate bowl combine flour, remaining sugar, salt and cinnamon. To the yeast mixture add the egg, butter and maple extract. Mix well to combine. 3. Add flour mixture to yeast mixture. Mix well until dough is smooth and pulls cleanly away from the bottom and sides of the bowl, about 5 minutes. 4. Place dough in a lightly oiled bowl and cover with plastic wrap. Leave dough to rise until doubled in size, about 1 hour. 1. While the dough is rising, make the filling. In a small bowl combine sugar, cinnamon, salt and melted butter. 2. After an hour, punch down dough. Roll out dough on a lightly floured surface into an 18 x 12-in. rectangle. Spread filling mixture evenly over dough. With the long edge facing you, tightly roll up dough in jelly roll fashion. Cut roll crosswise into 12 equal sized pieces. Place rolls in a lightly oiled 12-in cast iron pan. Cover with a damp cloth and let rise until doubled in size, 30 to 40 minutes. 3. Preheat oven to 375ºF. Remove damp cloth and bake until golden brown and baked through, about 30-45 minutes. 1. In a small pot over medium heat combine all glaze ingredients. Bring to a boil then reduce heat to low and simmer for 3 to 5 minutes, until glaze is sticky and thickened. Pour over warm rolls.